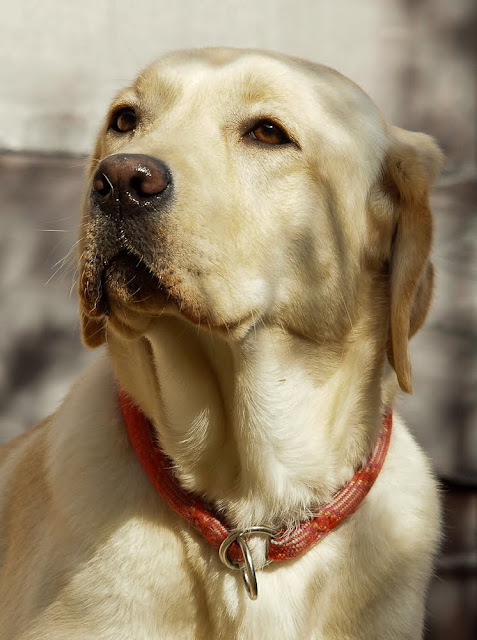 You've met Daisy, the Labrador, on this blog before. She lives in Cannes but stays here when her owners are away. This photo is the result of needing to practice with the new camera that dear Santa Claus delivered for Christmas. I'm pleased with the shot and hope you like it too. And by the way, all the others taken on the same day were awful...so there is much to learn! what kind of new camera? Do tell. I wonder if I'll ever make the jump..
An absolutely adorable sweet face. You captured her perfectly. She melts ones heart Jilly, a noble breed is the Labrador. As you know, I love all four of mine to bits.